Grinding your teeth in your sleep, also known as “bruxism,” is an unconscious behavior that can cause serious consequences for your oral health. If you find you are grinding your teeth in your sleep most nights, our Kalamazoo, MI dentist can help improve your dental situation. If you have any additional questions or want to learn more about night guards, don’t hesitate to contact our dental office today for more information. People can end up grinding their teeth in their sleep for any number of reasons, including a misaligned jaw or bite, anxiety or stress, TMJ disorder, certain medications, and other medical conditions or diseases. Teeth grinding can become a serious dental issue, however. Over time, grinding your teeth can cause cracks or chips in your tooth enamel, headaches, pain or stiffness in your neck or jaw, or even severely damaged teeth. If your teeth grinding is an ongoing problem, our Kalamazoo dentist might recommend a night guard. A night guard is a type of mouth guard that forms a barrier between your upper and lower teeth, preventing you from grinding them and keeping your bite aligned while you sleep. Should you decide that a night guard could work for you, our team will create a custom night guard that’s fitted to the shape of your mouth for maximum comfort. It might feel awkward to wear at first, but once you get used to it you won’t even notice it’s there. At your appointment, our dentist will also discuss other ways to help reduce your nighttime teeth grinding. They may suggest that you cut back on alcohol or caffeine consumption or even stop chewing gum, as these can all increase your teeth grinding. 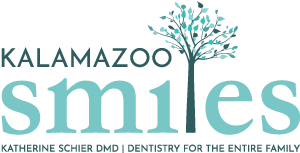 If you struggle with grinding your teeth, call the Kalamazoo night guard dentist at Kalamazoo Smiles. Our team is always willing to find a solution that works for you. Visit our office or give us a call at (269) 353-3700 to make an appointment today.